We take a look at the use of film, drone footage, 360 degree virtual tours, and immersive initiatives such as Virtual and Augmented Reality, and how they are bringing institutions to life online and enhancing the experience for visitors to campus. The student experience does not start when a student arrives on campus. It starts when they first interact with institutions. So for some time now Universities have been investing in and distributing high impact film to create an emotional response and connection with these prospective students. One of our clients, the University of Winchester, does this to great effect on its homepage with slow motion footage. It shows the diversity of student interests and the attitude and personality of the institution which resonates with and attracts students. In Australia, the University of Sydney offers self guided online tours where site visitors can explore the campus and view time-lapse and slow motion footage. It provides a measure of control for the viewer whilst still delivering aspirational content with a voice over provided by current students. Cambridge University in the UK has also benefited from involving current students in their film content. Their ‘My Cambridge’ film has now been viewed over 170,000 times on YouTube and gets across key messages, allays potential fears and misconceptions and gives prospective students real insights into various aspects of University life. More generally, the quality of institutions’ Vimeo and YouTube channels continues to rise as Universities have brought more sophistication to their content. The value from creating and investing in this content is really broad and it speaks to different audiences in various ways. Massachusetts Institute of Technology (MIT) has long recognized this and continues to create world leading content and publishes it across various channels. For YouTube they categorize content into ‘News’, ‘From around the Institute’, ‘Life at MIT’, ‘Mold it, Make it, Bend it, Break it’. The films are each interesting in their own right but collectively they also back up what they stand for - a deep commitment to innovation, education and research. Here are more great examples of inspiring films which are designed to deliver compelling reasons to attend their University. They get you excited about education, tell a story and showcase the unique attributes of each institution: Imperial College London, Northwestern University, Illinois, London Metropolitan University, Cornell University, Georgia Institute of Technology. Timelapse and drone footage creates a real impact when it’s created with care. The quality of these types of film is also getting better as camera and drone technology and techniques improve. The University of Birmingham created a fantastic film by overlaying building information on their drone footage to provide not just something attractive but also a sense of the layout and heritage of the campus. Newcastle University took a similar approach overlaying building information over timelapse film to great effect. Virtual tours remain popular to help prospective students and their parents get a deeper understanding for an institution before visiting or instead of a visit. In the US, and Australia, in particular, virtual tour investment has been high. The solutions are sophisticated with high quality user-controlled 360 degree campus imagery, students providing commentary talking directly to the viewer, map controls and other mixed media content covering other University facts and soundbites. Here are some great examples - The University of New South Wales, Hanover College, Gonzaga University, Harvard University. This is the new world with immersive technology entering institution marketing initiatives and contributing to campus experiences, from afar with virtual reality (VR) , and generally on campus through augmented reality (AR). Virtual reality headsets are increasingly affordable and entry models start at under $10. 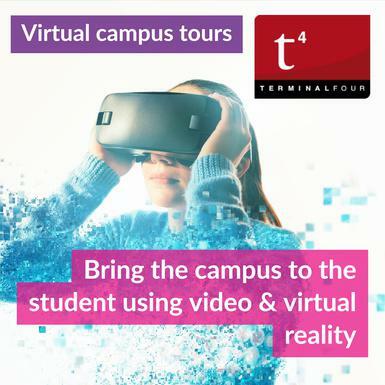 With more headsets in circulation the chances of prospective students having access to be able to try VR campus experiences is rising all the time. Beyond personal use in the home for prospects to research a University, VR is also proving a great way to generate a buzz at external institution events, for example, to draw prospective students to a stand and to give them the opportunity to get an immersive experience of the campus through headsets. The Savannah School of Art and Design were relatively early adopters of the technology and created a beautifully conceived VR tour. They also sent Google cardboard devices to prospective students so they could experience the campus in 3D. Meanwhile, the University of Surrey has created a dedicated virtual reality app for both iOS and Android, providing 360 degree photos of the accommodation, content to enable prospective students to look around Guildford and a neat way to discover some of the best things to do in the local area. As VR becomes more prevalent perhaps it will also be included in direct mail campaigns or to accompany the delivery of printed prospectus. The direction of hardware and software development is also pointing at AR becoming a major disruptive force - Apple’s recent announcements, for example, indicate it’s commitment to and belief in AR. The technology is now finally beginning to open doors for a whole new world of possibilities. And although it is still relatively early days, some institutions are beginning to experiment with AR with great results. On campus AR can help with way finding and information provision by overlaying content on the actual landscape infront of prospective students and parents. The University of Exeter for example has used the Layar application (available for iPhone and Android) to overlay an augmented reality view of the campus with over 400 points of interest. A different application was taken by the University of Pittsburgh. 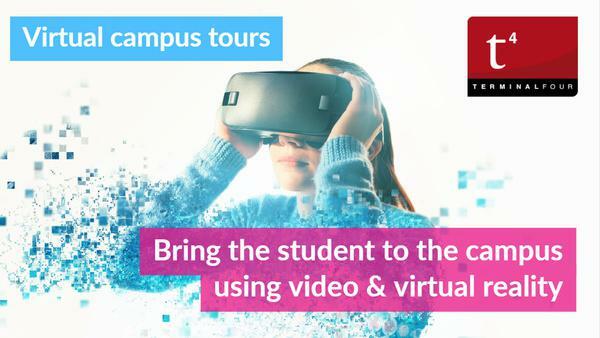 The University is working as part of a pilot scheme for YouVisit’s augmented reality tour app . It’s app gives users a birds eye view of the campus and city to create what looks like a detailed 3D model in their room. By tapping on interactive elements the prospective student is then able to learn more about that aspect of the campus. Meanwhile, Monash University used AR to bring print to life. They cleverly had the cover of course booklets spring to life using AR with props being used by the student presenters just beyond the region of the page to make it feel like the people were talking and interacting from the page itself. For institutions, having the ability to create immersive content for tactical off site recruitment initiatives as well enhancing the experience for prospects visiting a campus, and indeed for current students and staff, the possibilities are endless. Perhaps the next logical step is to create a cohesive integrated approach across these platforms to create a familiar and consistent experience across devices, context and technology. But what’s your view? What is the right balance in investment between engaging film, drone footage, 360 degree tours, virtual reality and augmented reality applications? And how should these be prioritised? Are VR headsets prevalent enough in your target market locations to justify the investment in VR experiences? Do you see AR applications being more useful in bringing print to life or in overlaying information in realtime around campus? And do you think there is more potential for Universities in AR or VR?